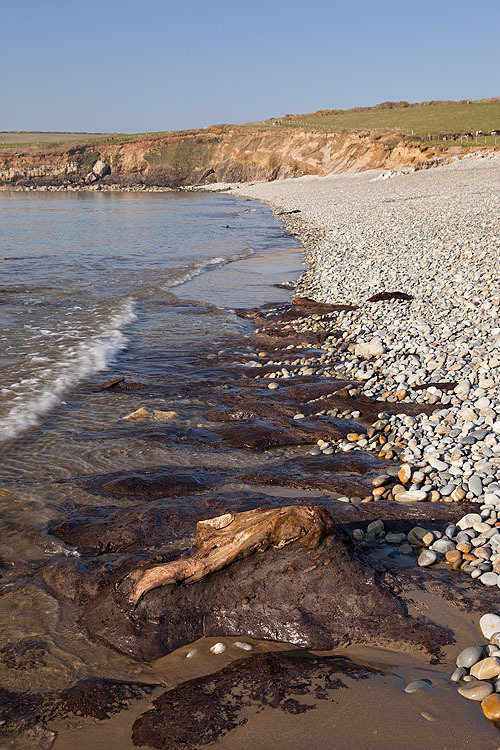 On Aber Mawr Beach , the submerged forest around the Pembrokeshire coast , drowned about 6,000 years old , makes an appearance . And as at Amroth the sand levels need to be low . The remains are close to the pebble bank. As the 'Ice Age' came to an end rising sea levels , flooded low coastal areas - reworking gravels and sands into sandy beaches and shinge ridges which gradually moved inland covering forests in the process. Amroth , Lydstep Haven and at times - Freshwater West , Manorbier , Newport , Newgale , Whitesands , Wiseman's Bridge.